Soloed Rainier and skied from the summit via the Disappointment Cleaver route, followed by a run down Nisqually Chute. The DC is in surprisingly good shape for skiing, with moderately suncupped slopes which softened nicely in the midday sun, even the steep field of penitentes on the Nose. 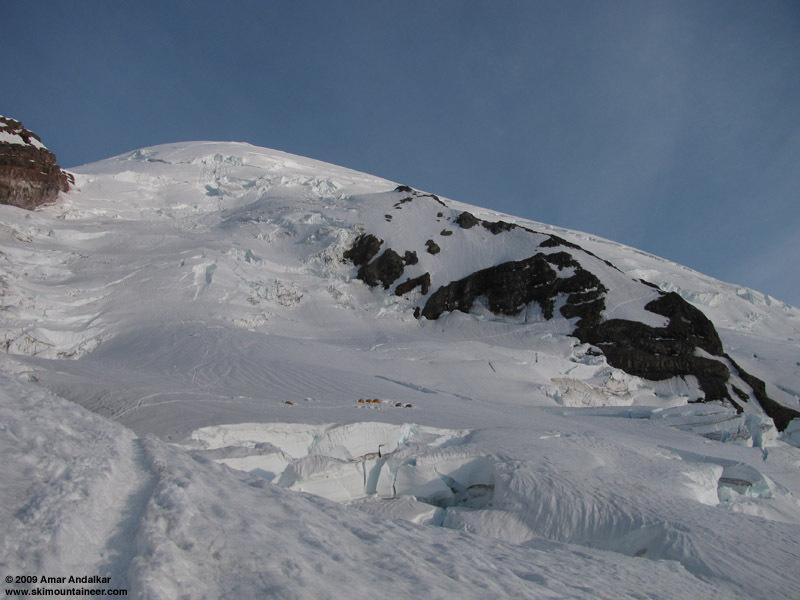 The upper Ingraham Glacier is very smooth, with recent heavy snowfall (during the past week of thunderstorms) producing an easily carveable windpacked surface above 12500 ft. Even the summit crater is filled with new snow, still almost powdery in spots. I'd had my pack packed for a week, planning each day to do this trip, but instead watching thunderstorms build each afternoon on the Mountain via webcam and deciding not to go. Days and days of frustration. Finally, it was time to just pull the trigger despite the ongoing marginal forecast and go for it. I got to Paradise by 4pm to register, but had to self-reg since the Climbing Info Center was closed�due to wildland fire training. Skinned up around 5pm, on nicely softened snow under thick overcast with no view of the Mountain. Broke above the clouds near 7600 ft and reached Muir just after 8pm in a dead calm and temps near 40 F. Continuous snow from the parking lot, except for four long bare sections along the summer trail between 6500 and 7200 ft which required carrying skis. Tried to sleep in the Muir Hut from 10pm to 4am, about a dozen climbers there, but slept poorly since I had neglected to bring a sleeping bag (down jacket + pack over the legs is not enough for me). 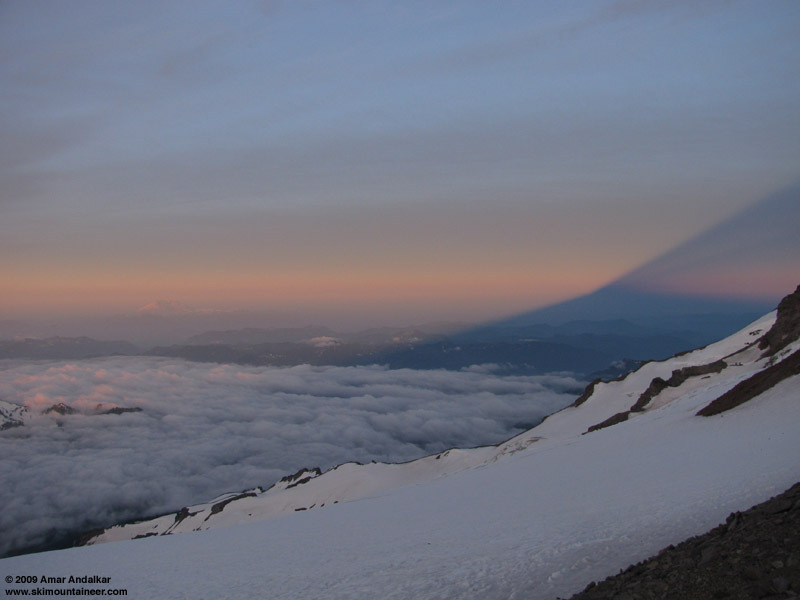 Sunrise from Camp Muir with the Mountain's awesome shadow. Headed up around 5:20am after watching the glorious sunrise, climbing on foot with crampons on the hard frozen snow, wearing a helmet and a harness just in case. A veil of high clouds obscured the sun, keeping temps very comfy but making me fear that the snow would not soften enough for decent skiing on the DC. A light NW breeze picked up once I reached the top of the cleaver at 12400 ft, reinforcing the fears. But skies brightened as I neared the crater rim, and the snow underfoot was not icy. 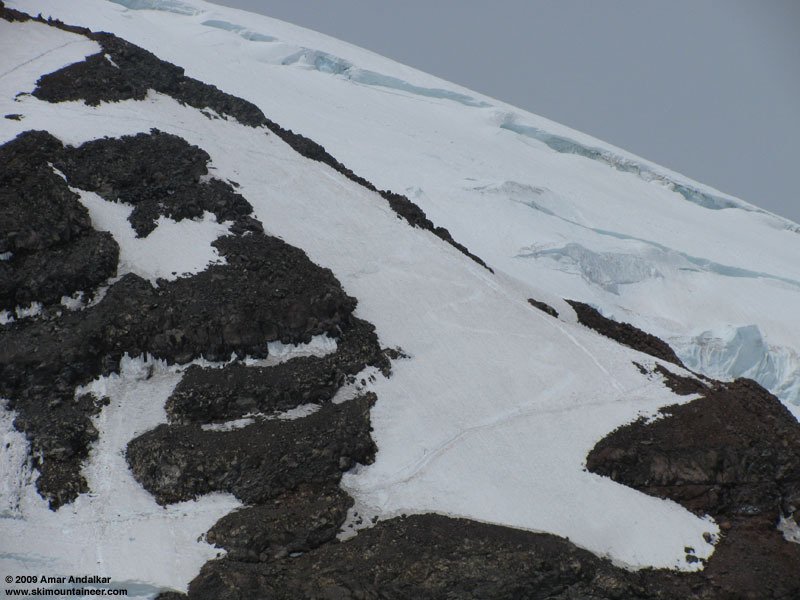 The upper portion of the route has a couple of sketchy crevasse crossings (one in particular requiring a 3-4 ft leap), but it's been re-routed farther to climber's right since my last ascent on May 24, and so is actually less sketchy now. Topped out on Columbia Crest at 10:20am, breezy with NW gusts to 20mph and temps a very comfy 23 F. Had the place to myself for 20 minutes, then skied down into the calm of the crater to melt a liter of water on the Jetboil. View of the Ingraham Glacier with Disappointment Cleaver at right (click for enlarged view). Headed down for good at 11:30am, finding carveable windpack on the upper Ingraham Glacier, softening into proto-corn on a few steeper rolls below 13000 ft. The DC had softened nicely by noon, and it was easy to carve turns through the moderately suncupped slopes and even through the 8-10" high penitentes on the steepest 40-degree slope at the Nose. There's several fixed lines installed on the Nose and a 50 ft long bare section of trail where the route traverses onto the DC. The top of Cathedral Gap was also melted out for about 100 vertical ft, and the rest of the slope there is melting out fast, but other than those two gaps the snow was continuous from the summit to Camp Muir. Zoomed view of my tracks on the nose of Disappointment Cleaver, above the fixed line and melted out section. The Muir Snowfield was OK, staying along the western edge for smoother (although dirtier) snow. Dropped down into Nisqually Chute, still good coverage, although very dirty and studded with fallen rocks in places. Stability was fine even at 2pm, with only a few minor sluffs of the topmost inch of snow. Skinned back to Glacier Vista and had a quick run back to Paradise before 3pm, no stickiness or pollen issues for me. A great day of late-spring skiing on the mountain, about 9500 ft of climbing for 9300 vert of turns. SYNOPSIS...ONSHORE SURFACE FLOW WILL CONTINUE TO PRODUCE MORNING CLOUDS WITH SOME AFTERNOON CLEARING THROUGH TUESDAY. A WEAK UPPER LEVEL TROUGH MAY PRODUCE SOME SHOWERS OVER THE MOUNTAINS THIS AFTERNOON AND EVENING. A WEAK FRONT WILL BRING A CHANCE OF SHOWERS TO THE COAST TUESDAY NIGHT...THEN SPREADING OVER INLAND AREAS WEDNESDAY. A WEAK UPPER LEVEL RIDGE WILL BRING DRY WEATHER THURSDAY AND FRIDAY...AND CONTINUING ONSHORE FLOW WILL KEEP MORNING CLOUDS OVER THE AREA AND TEMPERATURES CLOSE TO NORMAL. A LARGE UPPER LEVEL TROUGH MAY BRING ANOTHER CHANCE OF SHOWERS TO THE AREA LATER THIS WEEKEND. MONDAY...MOSTLY CLOUDY. A CHANCE OF SHOWERS IN THE LATE MORNING AND AFTERNOON. SNOW LEVEL 9500 FEET. MONDAY NIGHT...MOSTLY CLOUDY. A CHANCE OF SHOWERS IN THE EVENING. SNOW LEVEL 10500 FEET. TUESDAY...PARTLY SUNNY. A CHANCE OF SHOWERS IN THE MORNING. SNOW LEVEL 10000 FEET. TUESDAY NIGHT...CLOUDY WITH A CHANCE OF SHOWERS. A CHANCE OF SNOW SHOWERS. SNOW LEVEL 10000 FEET. WEDNESDAY...CLOUDY. A CHANCE OF SHOWERS. SNOW LEVEL 9000 FEET. Im glad the weather and snow conditions worked out for you. Awsome Amar!!!!!! Might just get up there this week a give DC a go...VERY COOL!!!!!!!! !